Finally, graduation! A hope for a bright future but absolutely uncertain at what awaits. This is a proud moment for our family. 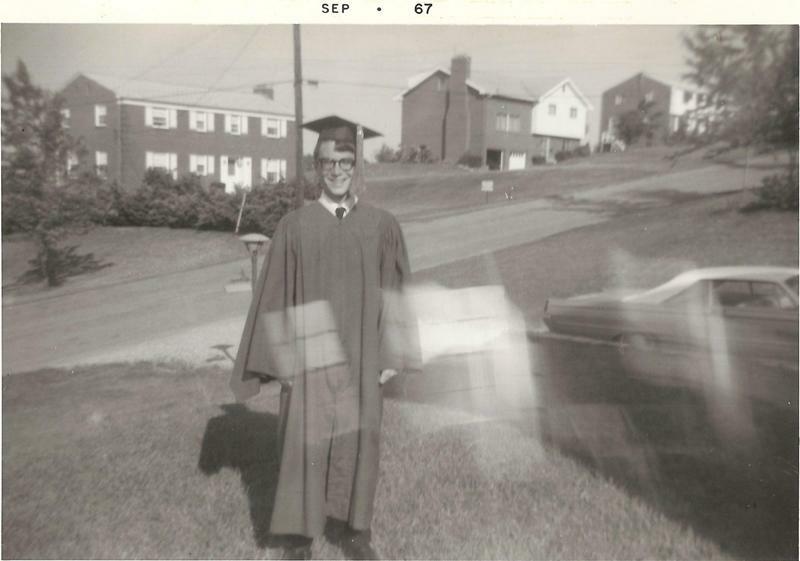 We moved to Upper St. Clair in 1959. The next series of photos shows myself, My immediate family and a photo of my mother's sister Joy (Saucerman) Jones and her oldest daughter Jody Jones. On the left of this photo is my maternal grandmother, Leora Polar Saucerman. They had travelled from Midland, South Dakota. Our high school class colors were navy blue and powder blue. The class motto: "The high seas are for us to sail". The 20 year class reunion in 1987 was the only one as far as I know. Anyone in the class of 1967 should pursue immediate contact!